This upper-intermediate ESL lesson plan is the second of three on the theme of 'people'. 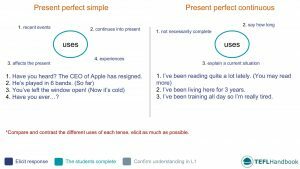 It contains activities, games and other teaching resources that focus on the present perfect simple and continuous tenses. 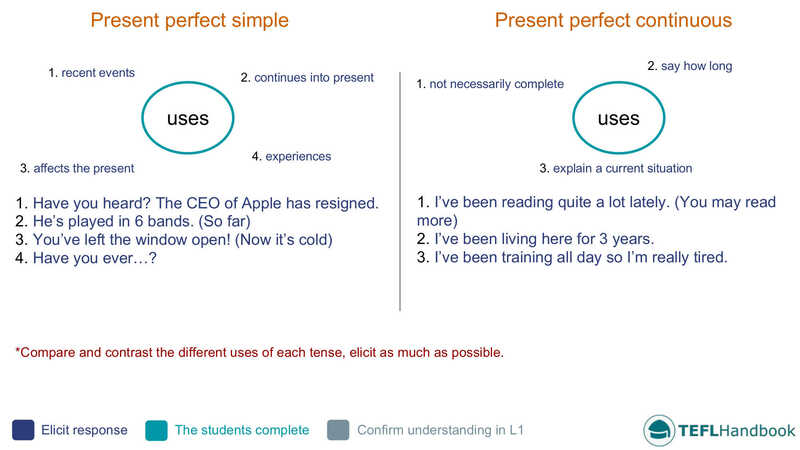 Compare and contrast the functional uses of both tenses with your students and try to elicit examples of each. The students will work in pairs to make statements using the present perfect simple or continuous. Start by adding the following list of verbs to the board. Tell them to create three from each tense and that these should be a mix of affirmative and negative. Encourage your students to make their statements as interesting and funny as possible. They should also indicate time in some way. When they have finished, you can review the sentences as a group. If you have used the sample board, you can elicit which rule of use each sentence corresponds to. Students have to complete a table by matching verbs to their corresponding collocation. Start off by explaining the difference between make and do. Next, draw a table on the board with the headings make and do. Try to elicit an example of each and add it to the board. Add the following list of words and phrases to the bottom of the board and have the students add them to the correct column. a phone call, an impression, a change, progress, a decision, friends, favours, a course, a choice, an arrangement, business, Physics, a mistake, an offer, an exam, dinner. Students should work on their own and compare answers with a classmate when they have finished. Students have to summarise an online interview with a well-known celebrity. Tell the class that for homework, they will have to summarise a recent online interview with a famous person. They should produce a text that summarises the piece (150 - 200 words). Inform them that they'll also have to answer questions during the next class. So, what have you been up to this year? Have you got anything exciting planned for the future? One student pretends to be a famous person while the rest of the class ask them interview questions to try and guess who they are. To keep it relevant to the lesson, the interviewing students should only ask questions in the present perfect simple and continuous. Also, the interviewee shouldn't use the names of well-known works that would uniquely identify them. For example, they can't say that they have directed a movie called Jurassic Park, but instead could say that they made a very successful film about a dinosaur theme park. We hope that you found a few of these ideas useful. Our next lesson in the series teaches students how to give longer answers to simple questions. Also, Be sure to bookmark our complete list of upper-intermediate level ESL lesson plans, as well as our entire collection of ESL courses.